On 25 January 1870 Adelbert Ames, the provisional governor of Mississippi, certified that the state legislature had elected Hiram Revels to the US Senate. On 23 February Revels presented his credentials, and two days later he was sworn into office as the first African American US senator. Visitors in the Senate galleries burst into applause, aware that history was being made, but there was opposition. Some white supremacist senators claimed that Revels had not been a citizen for the nine years required to join that body, as African Americans had only received citizenship with the passage of the 1866 Civil Rights Act. Senator Charles Sumner of Massachusetts rose to refute that logic: “The time has passed for argument. Nothing more need be said. For a long time, it has been clear that colored persons must be Senators.” The Senate then voted forty-eight to eight to seat Revels. Revels arrived in the US Senate by a circuitous route. Born on 27 September 1827 in North Carolina, a slave state, of free parents of African and American Indian descent, he had been apprenticed to his brother, Elias, as a barber. When Elias died suddenly, Hiram found himself in Indiana, being educated at a Quaker seminary, and he became a Methodist minister in 1845. He settled in Baltimore as a church pastor and educator and with the outbreak of war in 1861 became deeply involved in the plight of the freed slaves. At this time he rejected attempts to force him to ride in smoking cars on trains and faced opposition in Missouri for “preaching the gospel to Negroes.” Pursuing this mission, he moved to Vicksburg to help organize schools and churches among the former slaves. He also helped organize two regiments of black soldiers for service in the Union Army and served as chaplain to a black regiment. At the end of the war Revels moved to Natchez, where he continued his Methodist religious and educational work. A contemporary account described him as “a tall, portly man, of light complexion; [with] benevolent features, a pleasant voice, and cultivated manners. He is thoroughly respected by his own people, and by the whites.” Perhaps because of these qualities, Revels found it difficult to separate his religious work from politics and was elected to the position of city councilman and then state senator from Adams County in 1865. He described the excitement of political competition during Reconstruction in an 1869 letter: “We have but little money to carry on the canvass, but we are working day and night. Clubs are organized all over the State, and colored men meet in them once and sometimes twice a week, and receive instructions which no Democratic orator can remove from their minds. We are also meeting the enemy on the stump and he inevitably gets the worst of it. I am working very hard in politics and other matters. We are determined that Mississippi shall be settled on a basis of justice and political and legal equality.” Revels served in these positions with so much distinction that the state legislature selected him as the best candidate to represent Mississippi in the US Senate, where he filled out the final year (1870–71) of former Confederate president Jefferson Davis’s term. During that time, Revels attempted to avoid friction with white southerners but also supported desegregation of the schools and railroads, spoke on behalf of the federal government’s power to guarantee black voting rights in the South, and called on the US Military Academy at West Point to admit an African American cadet, Mississippi native Michael Howard. 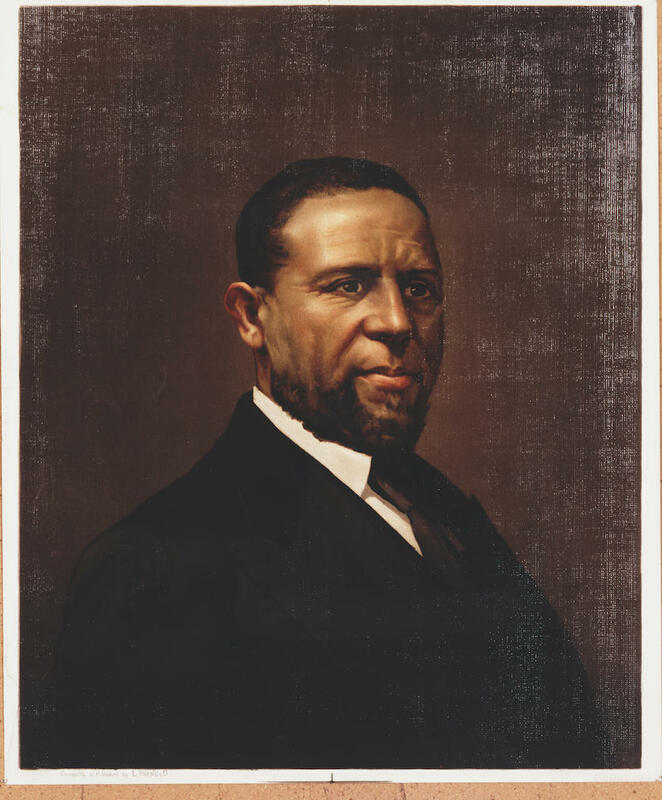 When Revels’s term ended in 1871 he returned to Mississippi to become president of Alcorn College, Mississippi’s first college for black students. Though Gov. Ames dismissed Revels from the position in 1874, he returned to it two years later. His last significant act was to participate in the 1875 political revolt against Mississippi’s carpetbag government, which he believed to be corrupt. Rejecting Ames and his associates, Revels converted to the Democratic Party. Continuing at Alcorn until his retirement, he never gave up his church work. He died at a church conference in Aberdeen, Mississippi, on 16 January 1901 and is buried in Holly Springs.